DO YOU WANT TO DETOX WITH US? We can't contain our happy over our Beyond Vegan Mineral Fast Facebook Group. Over the last 2 weeks we moderated a group of clients who wanted to fast with us and it was AMAZING! We took our group through how to prepare for a fast both physically AND emotionally. The FB Lives were the best part. Getting to share with our community all the experiences we've had over the last 10 years of detoxing. We will be doing a group fast every season moving forward. And we would love for you to join us. Or, you can take our eCourse anytime you like and join the FB Group to get all the information provided by us and our community. If you are ill or feeling unbalanced and want to get more control over the wellness of your body, fasting is the answer. We have allowed our bodies the ability to heal themselves through adopting an Alkaline Eclectic lifestyle and you can to. Fasting is an excellent start to your healthy adventure. 1. Read up on the Alkaline Eclectic Lifestyle. 2. Sign up for the Beyond Vegan Minerals Fast. 3. 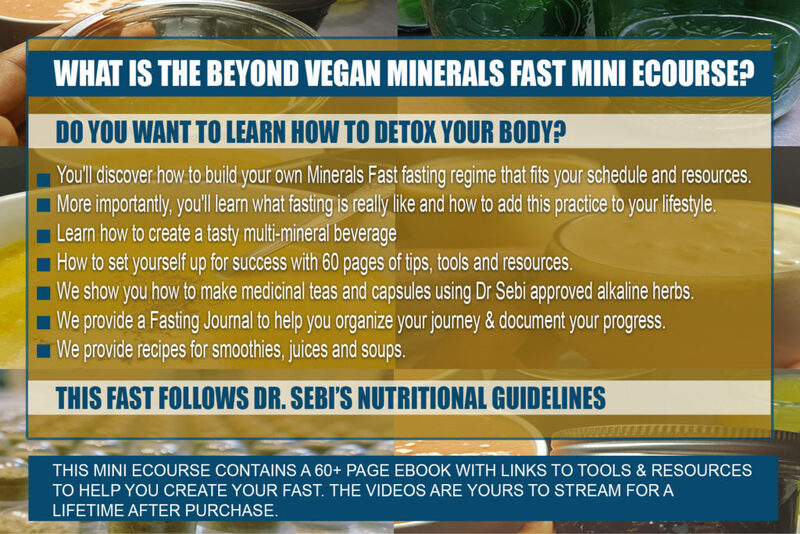 Join our Beyond Vegan Minerals Fast FB Group. 4. Take it to the next level with our Mucus Free Food Detox. 5. Learn the ins and outs of cooking using Dr. Sebi's Nutritional Guide with our cookbooks Beyond Vegan | Chickpeas and Beyond Vegan | An Alkaline Holiday.